I believe to love and be loved is our most fundamental need and our highest calling in life. Sustained love requires commitment and devotion. Similar to the act of kneading dough, love takes effort. At times kneading (and needing) can be frustrating. Both dough and love can be gooey and messy. Anyone who has ever worked with dough knows it can stick all over your fingers and to the surface on which you work. Just as in kneading dough, love is not for the faint-hearted. Love tests our inner strength and our emotional endurance. Love asks for our unwavering commitment and devotion. Sustained love requires balance, just as the process of kneading dough requires balance. Perfectly kneaded dough needs a balance of flour and water. When this balance is achieved, the dough is no longer a gooey mess and instead it is ready to be shaped into a pie crust, scones, or bread. As in love, we need to compromise and adjust the ingredients until we achieve balance. When this is done, our love becomes something that will feed and enrich ourselves and others. Balanced love asks us to give and to receive. In love and kneading, the results of our efforts need an optimum environment for success. When we knead, we need a good surface on which to work. Love too needs a good surface, a solid foundation. We need to apply a tender touch to both dough and love. Love especially needs to be nurtured and tended to. Like a flower, love needs to be given water and sun to grow and blossom, to thrive. Dry dough thirsts for water and gooey dough craves sun (flour). Without nourishment and sustenance the flower will wither away and the dough will fall apart. Love too will wither and crumble. With tenderness, kindness, and attention love with thrive. Love fills us up – it nurtures and nourishes us in our bodies, hearts, and souls. We need everything that loves gives to us in order to thrive and survive. We need to touch and be touched. We need to hold and be held. We need someone we can lean on. We need to be deeply connected to another soul. We need someone to know us inside and out and we need to know the one we love to the same depth or deeper. We need to be heard and feel understood. We need to be emotionally supported. We need to express our thoughts, feelings, and emotions and in return, we receive and hold, graciously and compassionately, the thoughts, feelings, and emotions of those we love. We need to be valued. We need to be treasured. This entry was posted in Blog, Inner Peace, Interpersonal Peace by myinnermystic. Bookmark the permalink. a yogini's reflections and insights into her healing, transformation, and journey of the heart Three highly transformative “events” changed the trajectory and landscape of my life and heart: 1) The biggest relationship of my life ended in a giant “ka-boom.” The circumstances of the ka-boom and the loss of “my person” was extremely emotionally traumatic. I was devastated, hurt to my very core. I have never been in so much pain and I grieved hard for a very long time. I remember how hard my dad cried when my brother died (my brother was 27 and I was a senior in college). My dad sobbed with every muscle in his body and from the depths of his core. That is how hard I cried, that is how deep and profound the hurt and this loss was for me. To continue reading, visit "About the Author" on my blog. Great analogy, what a lovely post! Thank you. It’s great to be a part of the community here on PeaceMeal. I look forward to nurturing the connection. We’re so happy to have you involved, too. Looking forward to more of your delicious thoughts! Reblogged this on My Inner Mystic. Wonderful metaphor and so beautifully written. 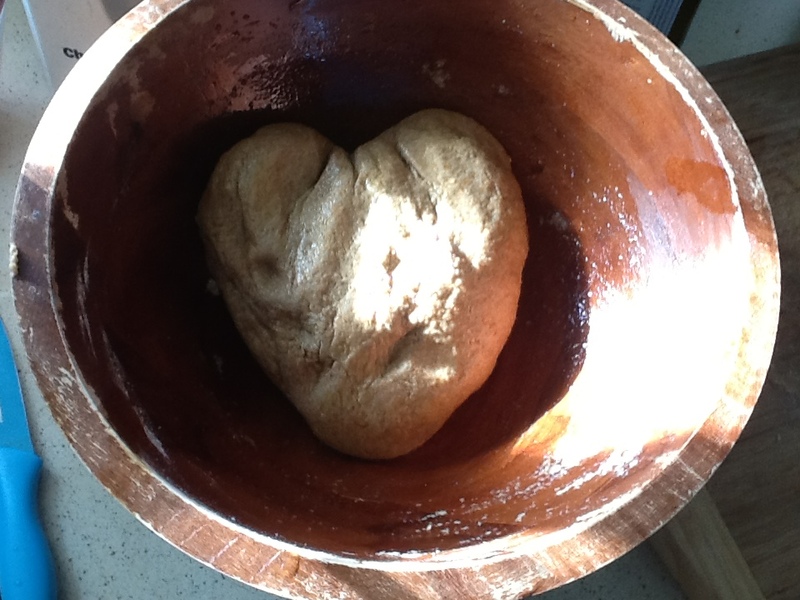 Love the picture of the dough in the shape of a heart!